Is sweet your red wine type? Understanding what, you, wine consumer, like or dislike in a particular red wine type, is a quest that consumer researchers are eager to crack. 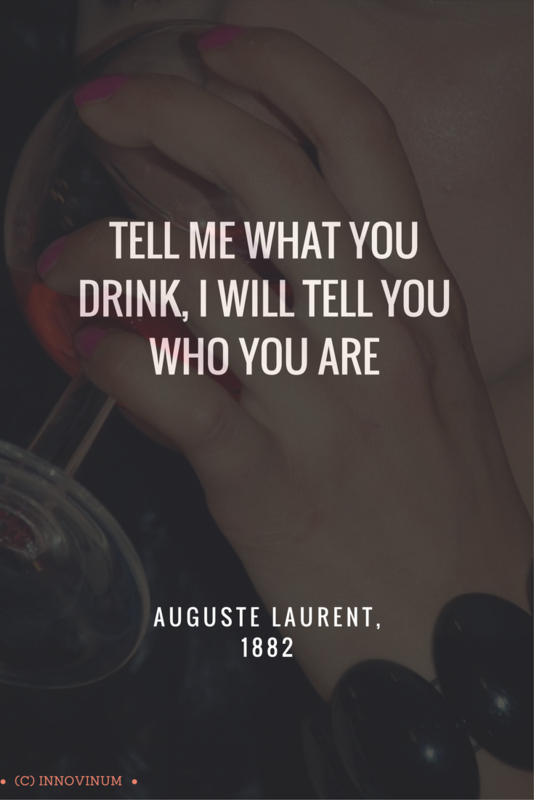 "Tell me what you drink, I will tell you who you are" is a wine adaptation the famous quote allocated to chef Brilliat-Savarin in 1882 : “Tell me what you eat, and I will tell you who you are”. Admitting liking a bit of sweetness in red wine is a big no no for the wine snobs. We would rather claim to like fruitier wines or smoother wines. But look at the wine shelves! When Yellow Tail Shiraz hit the US market in the early 2000s, bottles literally flew off the shelves. Then Apothetic Red came on and grew rapidly in popularity as well. These commercial successes made the wine academics wonder what was the “ideal” sweetness levels preferred by consumers in wine. Paul Rozin et al. (1986) categorized alcoholic beverages as “initially unpalatable substances” that the young adult eventually acquired a preference for. The first time you tasted red wine, I bet you found it acidic, and bitter, in other words unpleasant. You may have started to drink sweeter and fruitier wines, which have familiar taste and flavours that you learned to appreciate during your childhood. Julie Menella et al. (2016) suggested the increased sugar content in Westerners’ diets in early childhood may have increased this noticeable preference for sweeter wines among younger tasters. They recruited 114 participants from their academic institution by asking them to fill out a questionnaire to determine their gender, age, wine drinking experience and personality type. Wine drinking experience was categorized as novice or experienced consumers, based on a combination of self-reported consumption, years of experience in drinking wine, wine knowledge, and involvement in the wine industry. Personality traits (openness to experience, conscientiousness, extraversion, neuroticism and agreeableness) were assessed by the Big 5 personality-test, which consists in 50 questions to be answered online. The researchers elected to test consumer sweetness liking by spiking a young Portuguese wine with no residual sugar and noticeable astringency: a 2014 blend of Syrah (80%), Touriga Nacional, Cabernet Sauvignon and Trincadeira varieties (20%). They then produced the sweetened samples by adding equal amounts of glucose and fructose to end up with the following residual sugar concentrations in finished wines of 2, 4, 8, 16 and 32 g/L. The sensory method used to assess participants liking for sweet wines was a two ascending forced choice (2-AFC) test. Participants were presented five pairs of red wine samples. Each pair included the base wine (control) and a wine spiked at a defined sugar level; they were asked to select the wine they preferred among each pair, without any information about the test purpose. The 5 pairs were presented in increasing sugar concentration. Respondents were instructed to taste the wine, expectorate, rinse their mouth with water and wait 1 min before going on to the next sample. The wine (30 mL) was poured at 18 °C in transparent ISO standard glasses, labeled with randomized 3-digit numbers. Time was given as much as they needed to complete the test and released after tasting all the samples. Findings confirmed that the ideal sweetness levels varied among the consumer group, from 2g/L to 32g/L, with a maximum number of participants liking the most red wine with 8g/L. Other scientists have described consumer food preferences to be segmented in sweet likers and sweet dislikers. Results only showed the influence of gender and drinking experience on red wine sweetness preference. 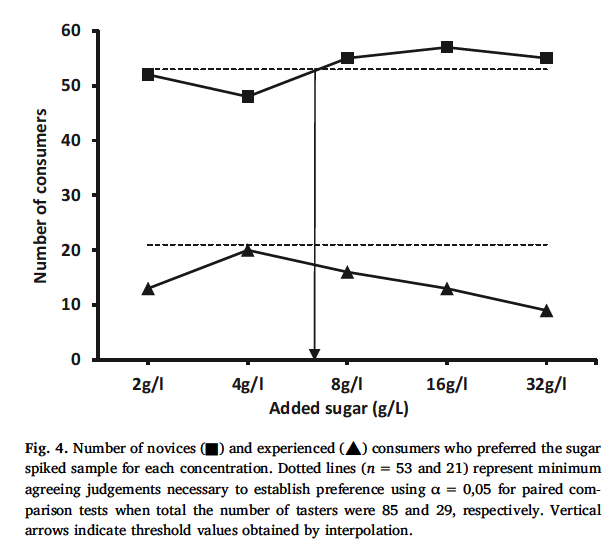 Women preferred the spiked samples up to 32 g/L, concentration under which preference could be established for the sweeter wine (Fig. 3). 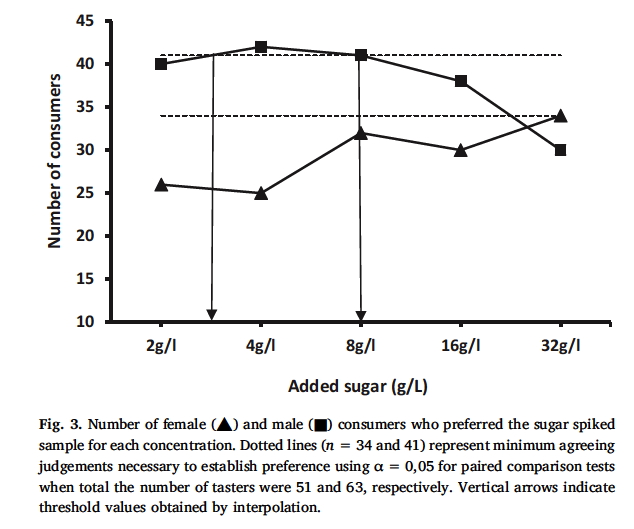 Males preference for sugar was observed between 3 and 8 g/L, with an inverted U-shape response curve. 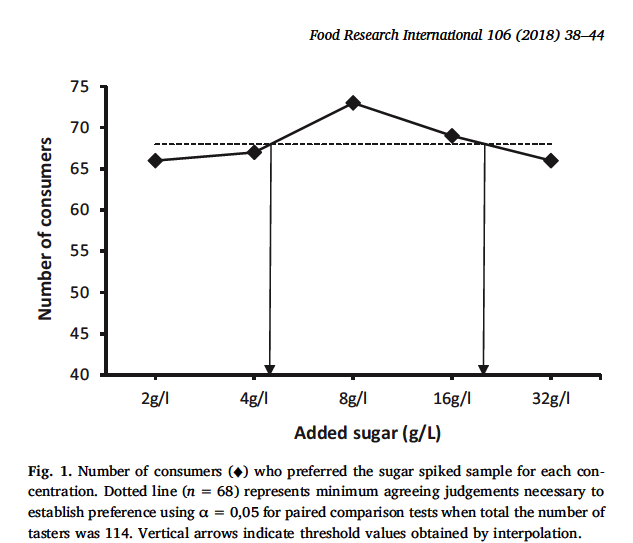 The experienced consumers did not show a preference for sugar levels while the novice group showed preference over 7 g/L up to the maximum level of 32 g/L. These results aligned with what we know about the determinants of food preference. As a consumer, you will tend to like a red wine type that is familiar and safe. If you are new to red wine drinking, you will tend to like a little sweetness in your wine. An other example is for consumers from a specific wine region; they will have greater exposure to local wines and will likely prefer the wines produced in this region rather than the wines from unknown wine areas. That explains why I love sparkling wines, being a native of the Champagne region. I had more exposure to the different styles and also to a culture inviting to celebrate with Champagne any occasions and not only the New Year. I also learned to like Sparkling Shiraz, having being initiated to that particular red wine type by my Aussie friends. I was particularly interested in the article findings that could relate sweetness preference and personality traits. Unfortunately, the number of participants was too small to allow a balanced representation of high and low levels of each trait. Researchers should have conducted a stratified sampling when recruiting participants to ensure having sub-groups of personality traits that could have been compared on their sweetness liking in a red wine type. I guess they wanted to address too many questions with a small size study. Although this study has limitations, it illustrates that liking some sweetness in red wine is real and the commercial success of sweeter wines addressed a consumer need for this particular red wine type. Sena-Esteves M. M., Mota M., Malfeito-Ferreira M. (2018), Patterns of sweetness preference in red wine according to consumer characterisation, Food Research International, 106, 38-44. Menella, J., Bobowski, N., & Reed, D. (2016). The development of sweet taste: From biology to hedonics. Reviews in Endocrinology and Metabolism Disorder, 17, 171–178. P. Rozin, T.A. Vollmecke. (1986). Food likes and dislikes. Annu. Rev. Nutr. 6 , 433-456 . Wine consumer flavour preferences. In proceedings of the 1st Wine Active Compounds symposium, pp 71-74. Chassagne D., University of Burgundy (ed. ), OenoPluriMedia, Chaintré, France.